This experiment demonstrates the basic features of hurricanes and tornadoes in spectacular fashion. With a kitchen turntable or a spinning stool, it can be put together with common classroom materials. A tutorial on hurricanes is included. Lecture slides are attached. Video instructions for constructing a miniature flaming hurricane. The first time I saw the flaming vortex was in a video by Steve Spangler at http://www.youtube.com/watch?v=0-qbTPX4Q7o. The video produced by NightHawkinLight (above) offers some nice refinements and detailed instructions. You will need a source of steady flame (alcohol, lighter fluid, or sterno), a turntable, and a steel mesh wastebasket. The tabletop flaming hurricane works very much like a real hurricane or tornado, and offers a good basis for discussing the science of these vortex storms. WARNING: Since the demonstration involves an open flame, it should only be performed with careful adult supervision. Safety glasses, fireproof gloves, and a fire extinguisher are strongly recommended. Fig. 1: Airflow in an updraft over the ocean. A local warm spot in the ocean initiates an updraft that brings in cool air from the surrounding region. 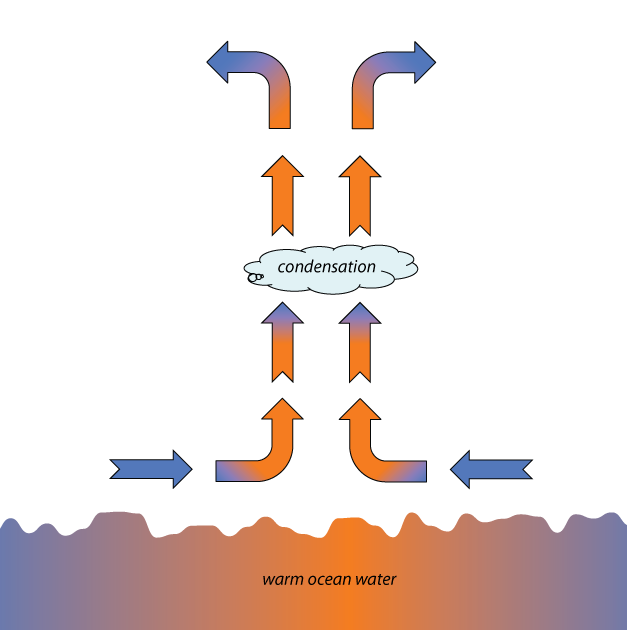 As the air rises to higher altitude, it cools enough to condense the water vapor it carries. The condensation releases heat into the air, rewarming it and causing it to rise still further. Fig. 2: The rotating earth. 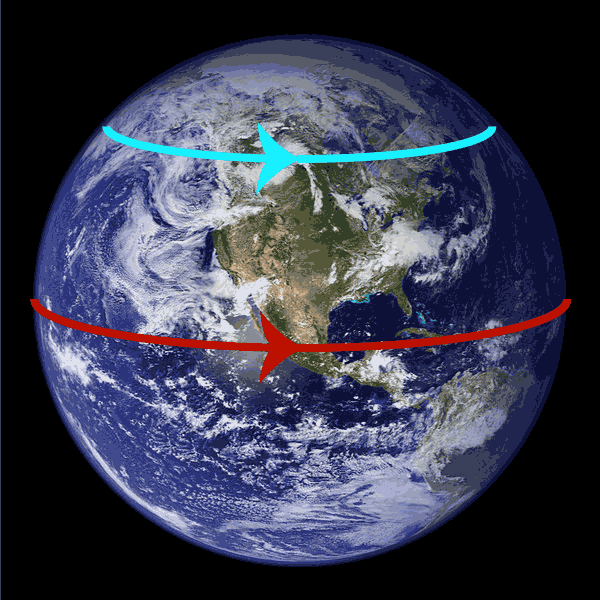 Objects at the equator rotate with the earth in a large circle (red line). An objects closer to the pole rotates in a smaller circle (cyan line). Fig. 3: Schematic showing the overhead view of a hurricane in the northern hemisphere. 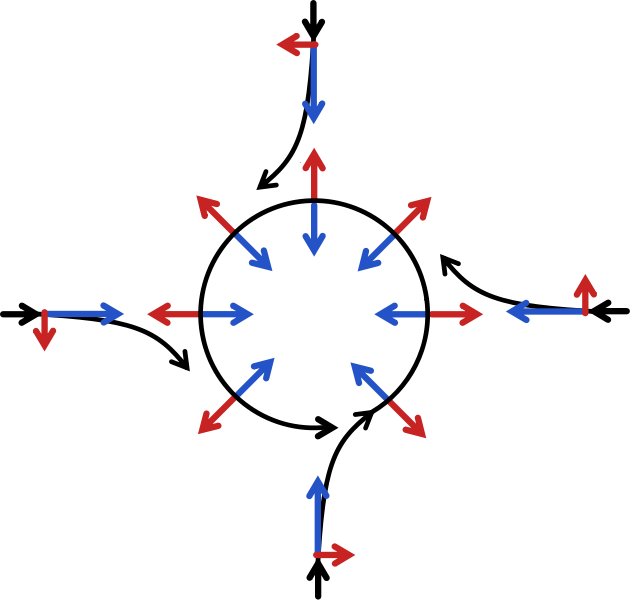 Air is drawn in towards the low pressure region at the center of the storm (blue arrows) and is deflected by the Coriolis effect (red arrows) so that the air ends up circulating in a counter-clockwise direction (black arrows). Fig. 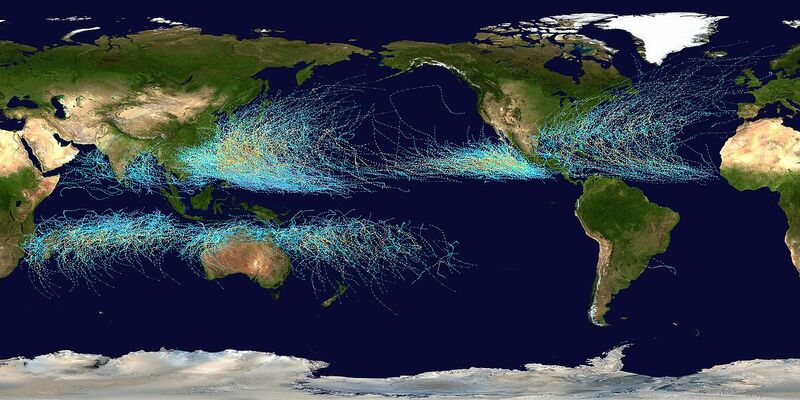 4: Map of the tracks of all tropical cyclones that formed worldwide from 1985 to 2005. The points show the locations of the storms at six-hourly intervals. Note that the storms only form more than 5 degrees away from the equator. Closer to the equator, the Coriolis effect is not strong enough to generate the circulating winds. Hurricanes begin with a localized updraft of warm air over the ocean. As sunlight heats the water, air near the surface of the water is also warmed. As the air warms, it expands and rises. Now, air over the ocean is generally pretty humid. As the warm moist air rises to higher altitudes, the water vapor it carries cools and condenses. When water vapor condenses, it gives off heat in an exothermic reaction, rewarming the air and causing it to continue rising. Eventually, the air cools and dissipates in the upper troposphere. The winds produced in hurricanes don't just feed directly into the updraft, they spiral in toward the center of the storm. The reason for this behavior has to do with the rotation of the earth. In a hurricane or tropical storm in the northern hemisphere, as cool air is pulled in along the surface to replace the rising warm air, the northerly surface winds will be deflected eastward and the southerly surface winds will be deflected westward. As a result, the whole air pattern will begin to rotate counter clockwise from above (see figure 3). In the southern hemisphere, the rotation is reversed so that the storm rotates clockwise. The effect is bigger near the poles, where a given change in latitude produces a larger change in orbital radius. At the equator, a change in latitude hardly changes the oribtal radius at all, and the Coriolis effect is minimal.2 For this reason, hurricanes do not form close to the equator (see figure 4). The conservation of angular momentum around the earth's axis explains why hurricanes rotate counter clockwise in the northern hemisphere. Once the air starts rotating around the center of the hurricane, the conservation of angular momentum plays another role in the development of the storm. As rotating air is pulled in toward the center of the storm, its orbital speed increases, in accordance with the conservation of angular momentum. (In this case we are looking at angular momentum around the center of the storm rather than angular momentum around the earth's axis.) The winds speed up as they approach the center of the storm, sometimes reaching speeds in excess of 50 m/s (110 mph). These high winds help sustain and even increase the storm. Higher wind speed drives more evaporation, which eventually produces more condensation, which releases more energy and powers a stronger updraft. Finally, the stronger updraft pulls in higher winds. Once started, a hurricane can continue to grow in this positive feedback loop as long as there is a source of warm water to feed it. In a real hurricane, condensation provides the power source for the storm, releasing heat and generating an updraft. In our tabletop hurricane, the alcohol flame provides the power as a replacement for the condensation. In a real hurricane, the Coriolis effect generates the initial rotation of the storm. However, the Coriolis effect only contributes over long distances; it has very little effect over the span of a table.3 Accordingly, in our tabletop storm we need to find a replacement for the Coriolis effect which will generate the initial rotation. This is where the rotating wastebasket comes in. As air is drawn in to the center of the desktop hurricane, it passes through the wall of the wastebasket. The spinning wastebasket exerts a drag force on the air and causes it to start rotating slowly in the same direction as the waste basket. As the air continues to move towards the center of the waste basket, its rotation increases in accordance with the conservation of angular momentum. The air speed increases just as it does in one of nature's hurricanes (though not quite so dramatically). By the time the air reaches the updraft, it is spinning rapidly enough to produce a swirling vortex of flame. Some graduate students at the University of Illinois have produced a masterful explanation of the Coriolis effect using a merry-go-round as an example. Check it out at https://www.youtube.com/watch?v=aeY9tY9vKgs. 1. In the northern hemisphere, the Coriolis effect also causes eastward moving objects to be deflected southward, and westward moving objects to be deflected northward, but these deflections are harder to picture. See the suggestions in further resources for good analogies with a merry-go-round. 2. Strictly speaking, the horizontal component of the Coriolis effect is minimal at the equator. However, another consequence of the Coriolis effect is to deflect eastward moving objects upwards and westward moving objects downwards. This part of the Coriolis effect is maximal at the equator. 3. Even for tornadoes, which are considerably larger than tables, the Coriolis effect plays no significant role. The rotation of tornados is generally produced by the collision of preexisting crosswinds.